One of the body's primary self-defense mechanisms is the conversion and neutralization of metabolic products and toxins into soluble and safe byproducts, which can then be eliminated. Many challenges to this essential process (e.g. Leaky Gut Syndrome, repeated exposure to foodborne toxic chemicals, environmental pollutants, bacterial endotoxins, etc.) can increase the detoxification burden. This overload can lead to greater production of free radicals that can cause damaging effects to many body systems. Assessing multiple pathways with challenge substances provides clinical information about individuals with imbalanced detoxification. The innovative Detoxification Profile from Genova Diagnostics Laboratory assesses the body's capacity to carry out detoxification through functional challenges - consisting of caffeine, acetaminophen, and salicylate - which evaluate specific aspects of the detoxification process and free radical damage. These functional assessements provide a comprehensive profile of the body's detoxification capacity and potential susceptibility to oxidative damage. Long term exposure to environmental pollutants and continued affronts to the detoxifying systems may lead to oxidative stress, high levels of P-450 activity, and reduced capacity for Phase II conjugation reactions. This can result in accumulation of the toxic compounds, damage to essential fatty acids, impairment of oxidative phosphorylation, and reduced energy production. Patients suffering from toxic burdens may experience a wide range of symptoms, including fatigue and poor tolerance for exercise. These processes have been postulated to be a central factor in the development of Chronic Fatigue Syndrome (CFS). A recent study reported that many CFS patients had impaired liver detoxification ability and showed signs of increased toxic exposure. All ingested and microbially-produced toxins are presented to the first-pass clearance system. First-pass clearance involves the biotransformation and clearance of a chemical from the body before it reaches the systemic circulation. This clearance may take place in several organ tissues including the intestinal mucosal wall and the liver. The liver is the body's primary detoxifying organ. 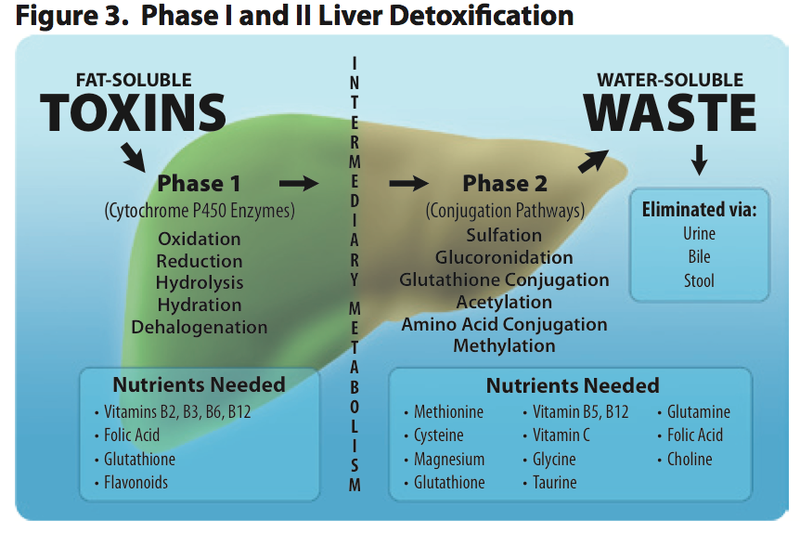 Here, detoxification is carried out in two related processes known as Phase I and Phase II. Phase I serves to biotransform substances through oxidation, reduction, or hydrolysis, using the cytochrome P-450 mixed-function oxidase enzymes. This process increases the solubility of molecules and prepares them for Phase II reactions which will further increase their solubility. The Phase I reactions are necessary for detoxification, but the resulting production of reactive oxygen species can at times be very damaging. Thus, the liver needs to be able to generate oxidation capacity when needed, yet at the same time generate no more than what is needed. Perhaps this is why Phase I systems are inducible by different compounds. In Phase II, conjugation reactions add a polar hydrophilic molecule to the metabolite or toxin, converting lipophilic substances to water-soluble forms for excretion and elimination. Phase II reactions may follow Phase I for some molecules or act directly on the toxin or metabolite. While the modification of Phase I and II enzyme activities has its basis in the research setting, there is growing appreciation of the clinical applications of such strategies. The intestinal mucosa is the primary barrier to permeation of toxic compounds and macromolecules. Abnormalities of the intestinal barrier system as detected by intestinal permeability assesment may lead to enhanced uptake of inflammatory luminal macromolecules, endotoxins, and xenobiotics. Impairment of intestinal integrity dramatically increases mucosal absorption of substances that are normally excluded. These foreign chemicals are presented to the liver's detoxifying system for processing and elimination. They can stress the detoxification capability of the liver or be partially processed and accumulate in the liver and adipose tissue. It has been speculated that the combination of leaky gut and dysfunctional liver detoxification can lead to increased tissue stores of toxic compounds and depressed immune status. In the Detoxification Profile, one caffeine caplet (200mg) is taken in the morning and its clearance is assessed from two salivary specimens collected two and eight hours after ingestion. Aspirin and acetaminophen are ingested in the evening and the products of detoxifying reactions are assessed in a 10-hour overnight urine specimen. The challenge dose consists of two capsules of acetaminophen (650mg total) and two capsules of aspirin (650mg total). The only side effect is potential drowsiness.